Welcome the borough’s own Shawn “JAY Z” Carter as part of his record-setting, sold-out, eight-night residency at the brand-new Barclays Center. This 13-time Grammy Award winner has undoubtedly redefined both the music industry and perceptions of the American Dream since bursting onto the scene in 1996. JAY Z is not only a New York Times bestselling author but also the founder and chairman of Rocawear and an entrepreneur with a stake in such varied enterprises as the 40/40 CLUBS, Translation Advertising, Carol’s Daughter natural beauty products and Barclays Center’s own Brooklyn Nets. JAY Z’s dominance of the music world is unquestionable. As President and CEO of Def Jam Recordings, he fostered the careers of international stars Rihanna, Ne-Yo and Kanye West. In 2008, JAY Z partnered with Live Nation to form the diverse entertainment company Roc Nation. With that venture’s first release, The Blueprint 3, JAY Z secured the record for most No. 1 albums by any solo artist. His recent collaboration with Kanye West, Watch the Throne, became the 12th JAY Z album to reach No. 1. 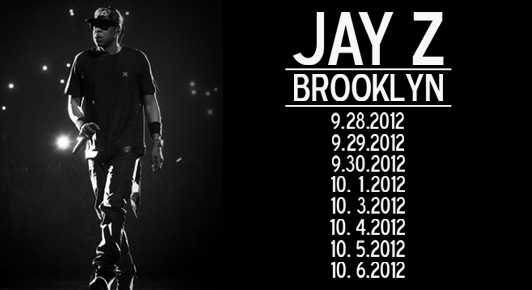 Brooklyn is proud to call JAY Z one of its own. Don’t miss out on your home-court advantage to witness the king solidify his reign right here in your very own backyard—only at Barclays Center! "Jay-Z wants his eight-night residency at the Barclays Center, which kicks off Friday at the venue's grand opening, to be a "celebration." "I pretty much have sing-alongs at the concert and I want to encourage that even more," he told Billboard at a launch event at his Manhattan venue the 40/40 Club for NBA 2k13, a new video game whose soundtrack he executive produced. "It's like a gift to Brooklyn to have this, to all us Brooklynites, to have this arena and this team. We just want to celebrate this team since it's the first since the Dodgers." Though Jay-Z is also a minority investor in the venue, he will ultimately have little control over future bookings. "I have enough jobs," he said with a laugh. "But they'll still ask my opinion on most things. I don't want that job, though." Rihanna, for example, just announced an upcoming gig on her Diamonds Tour, as have EDM trio Swedish House Mafia, clients of Roc Nation management partners Three Six Zero. "There's a little nepotism," Jay-Z allowed. "Rihanna's on Roc Nation, so of course she's playing the Barclays." The rap mogul is also hopeful for future installments of Made In America, the first-year Philly festival he curated and headlined this past Labor Day. "Oh yeah, we'll do it again," he said, before countering, "Well, we want to do it again. I don't know if it'll actually happen, but probably."